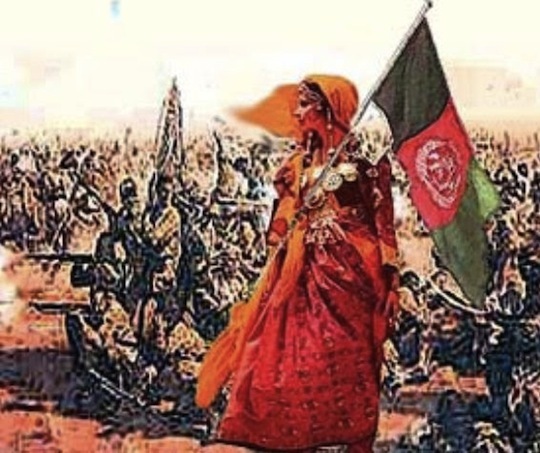 Also known as Malalai Anaa (Malalai “the grandmother”), she was born in the village Khig, approximately 3 miles southwest of a town called Maiwand in Afghanistan’s Kandahar province. In the late 1880s, British-Indian forces were attempting to colonize Afghanistan and incorporate the country with then British India and modern-day India and Pakistan. Kandahar housed the main garrison of the British in Afghanistan, making Kandahar, specifically Maiwand, a battle field. Ghazi Mohammad Ayub Khan (1857-1914) was the commander of the Afghan army in the Second Anglo-Afghan War, fought from 1878-1880 between the British and Afghanistan. On July 27th, 1880, Malalai’s father and fiance (or husband, according to some sources) joined the Afghan army to fight off the British. According to some, this was also her wedding day. Malalai was there with many other Afghan women to serve the soldiers by taking care of the wounded and providing them water and weapons. At one point, the Afghans were starting to lose hope, and it seemed as though the British would be the victors. This is where Malalai plays a significant role and makes a move that changes the fate of her people. Such as would put to shame the rose in the garden,”These words led to the Afghans’ victory. However, unfortunately at this moment, Malalai herself was killed. She was barely around 18 during her death. Her efforts were acknowledged and appreciated, and Ayub Khan himself, the commander, honored her. She was buried in her village in Kandahar, where her grave remains today. Today, although unheard of elsewhere, the name Malalai is very common among Afghans; it symbolizes courage, leadership, strength, for she sacrificed her own life to keep the Afghans fighting against their invaders. Many Afghan schoolchildren learn about her from a young age, and the nation prides itself with having her name carved in its history. She is honored not just as a heroine of the war but also as an icon against western imperialism. Indeed. Let’s not just make ourselves aware of her existence and her courage at a critical point in our history but let’s also be critical of our own history and ask why so little is known about one of our earliest female leaders in our history. Surely, she cannot have been the only female who fought so bravely–but why is she not known? What can we learn from her sacrifice and for our silence? Is it really enough to simply name our daughters after her, or should we be doing more–e.g., encouraging our daughters to follow her lead as well. What Malalai did at that time was an unheard-of phenomenon from women, since the only role that woman has traditionally and historically had in all wars, if one at all, is to serve the soldiers while the soldiers serve the nation; she does serve her people but very much indirectly, and her role is not appreciated. It is the actual, physical fighting on the battlefield that is appreciated. Malalai spoke up bravely and told her people that their loss would be a disgrace to their nation. What Malalai did at that time is considered a bold, courageous move because she was a woman, women did not do this sort of thing typically. Imagine what she would do today if she were living among us! She would put us all to shame, reminding us that what she did over a century ago, most of us would be afraid to do even today. So, let us ask ourselves: what exactly do we mean when we say that we honor her, that we are grateful to her, that she is a heroine to us? Is it really enough to only say these things, or must we do more? Thank you for reading! If you would like to recommend a Phenomenal Pashtun for me to write about in this series of Pashtun Personalities please don’t hesitate to make your suggestions. This entry was posted in Death to patriarchy and tagged Pashtun Leaders, Pashtuns. Bookmark the permalink.